France remains the world’s most popular tourist destination with much to see and experience from Paris to the sun-drenched south. Paris the city of lights and at first glance a transportation nightmare. However, once the tickets and maps are puzzled out, Paris has a fantastic public transportation network with rail links to Charles de Gaulle Airport (CDG) and Orly Airport (ORY), while the Les Cars Air France also provide sensible alternatives, especially when traveling with luggage. Fast trains link Paris to the provinces and neighbouring countries – Eurostar to London, TGV Lyria trains to Switzerland, and TGV Thalys and ICE trains to Germany, Belgium, and The Netherlands. Use the Metro or RER to connect to different Paris train stations. The Palace of Versailles is an easy day-trip destination from Paris, although staying here is a cheaper alternative and the town also a good place to pick-up or drop-off rental cars to avoid airport charges and having to drive in Paris. Champagne is a large region with much more to see than just the famous bubbly drink. Don’t miss the beautiful Reims Cathedral. The rest of the region has some places for a stopover when en route to the south. Troyes has a lovely half-timbered old town, arguably some of the best stained-glass windows anywhere and with the McArthur Glen mall some of the finest factory outlet stores in France. Langres, a wall-encircled small town, is also a fun stopover in the Champagne country side. Alsace has had close ties with Germany for centuries and exchange hands between France and Germany as recently as 1945. The main sight is Strasbourg with its half-timbered old town and magnificent High Gothic cathedral. However, the country side with vineyards and the Vosges Mountains is attractive too with many picturesque small towns, castles, and fine dining. Don’t miss Colmar, Mulhouse with the French National Motoring Museum, or Riquewihr – one of many beautiful wine towns. Lorraine, like Alsace, frequently changed hands but the German influence here is generally less pronounced. Both Metz and Nancy are worth seeing while the Maginot Line adds military history interest. Burgundy is famous for its fine wines. Don’t miss Dijon or the smaller towns in this famous wine-growing region including Beaune with its magnificent art. The Rhône Alpes region is famous for skiing but it is a year-round destination. The Alps may either be the destination or the magnificent background when visiting cities such as Grenoble or Chambery. Geneva Airport in Switzerland is often the main point of entry, especially during the winter ski season. The Côte d’Azur or French Riviera is one of the oldest tourist regions in the world and maintains its popularity throughout much of the year. Nice Airport is the busiest in France outside Paris with trains and buses providing fast transportation to many towns in the region including the Principality of Monaco. Provence is famous for its good quality food and high quality of life. Don’t miss the lavender fields although other agricultural produce also provide beauty to the landscape and taste to the local cuisine. The region is littered with magnificent Roman ruins, interesting cities, and art. Don’t miss Avignon, Orange, Pont du Gard, the Drôme Valley or the Ardeche Gorge. 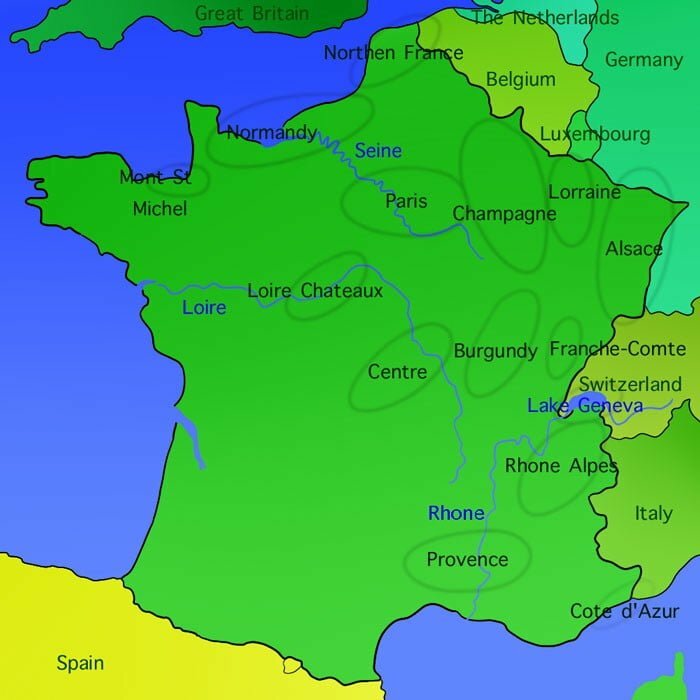 The large Centre region at the heart of France is often overlooked – over-flown or driven-through – by foreign visitors. A shame as there is much to see but fortunately few crowds. Bourges has an interesting cathedral and magnificent Gothic palace. The Loire chateaux offer a look into the lives of the nobility at the end of the Gothic and Renaissance periods. The region has endless palaces and castles from enormous Chambord to elegant Chenonceau. Leonardo da Vinci spent his final years in Amboise. Villandry has magnificent vegetable ornamental gardens while Valencay was the state guesthouse during the reign of Napoleon. The abbey on Mont St Michel is one of the most emblematic sights in France. Hugely popular with day-trippers, it is best experience early morning or at night. Nearby, German and allied Second World War cemeteries remind visitors that all have not alway been peaceful here. Normandy, a popular holiday region, offer sandy beaches but also loads of historical sights – D-Day landings and a day at the beach often combine at the same sites here. The American, British and German military cemeteries are sobering while many sites such Pointe du Hoc reminds of incredible human bravery. Bayeux has a magnificent Gothic cathedral and with the Bayeux Tapestry one of the finest medieval works of art ever made. The white cliffs of Etretat are worth a journey. Rouen, much damaged during the Second World War, still have many historical buildings including the fine High Gothic cathedral and equally large and impressive St Ouen church. The nearby Romanesque former abbey church of Jumièges is considered amongst the most beautiful ruins in France. The flat landscape and town architecture of Northern France have a lot in common with the Flanders region further north. Calais is often a simple ferry port or Eurotunnel terminal for many visitors but has cheap shopping and hotels for a continental stop en route back to Britain while the coastline is lovely too if often windswept. Amiens has the largest Gothic cathedral in France. Many First World War battlefields are in the region. Franche Comté, a region in the far east of France on the Swiss border, offer culture and interesting landscapes with the Jura mountains popular year round for outdoor activities. The capital Besancon has a mighty Vauban fortress while children love the zoo and the nearby Dino Park. The mountains of the Haute Savoy region have some of the most popular ski resorts in France. Most visitors here arrive via Geneva Airport in Switzerland with many transportation options available especially during the ski season. The souther shores of Lake Geneva (Lac Léman) are mostly part of France but with few large towns. However, Evian is world famous and tiny Yvoire one of the most popular day-trip destinations in the region. The Rhône and Saône Rivers in the south of France are amongst the most popular rivers in Europe for luxury riverboat cruises. The Rhône is navigable from Lyon southwards, while the Saône offer cruising opportunities from Lyon northwards. The meandering Seine River offer luxury riverboat cruises from Paris all the way to Le Havre on the English channel. Popular sights in route include Giverney, Rouen and Honfleur.